It was announced today that the star vehicle for the recent Barrett-Jackson Classic Car Auction in Scottsdale, Arizona has been sold for $1.1 million. 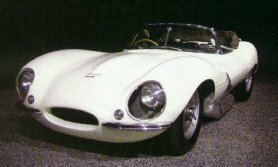 The 1957 Jaguar XKSS Roadster crossed the auction podium during Saturday afternoon in front of a capacity crowd, and watched also by millions of viewers on the Speed Channel live television auction coverage. The tense bidding on the historic car reached $950,000 at the auction, but did not meet the reserve price set on the car. After days of negotiating by Barrett- Jackson between the car's seller and the prospective buyer, a deal was finalized. "We are very pleased to be able to finally put this deal together," commented Craig Jackson, president of Barrett-Jackson Auction Company. "It would have been nice if it could have happened on the auction block, but we never stop working to get our auction cars sold. This is just one of over twenty cars that we were able to close deals on after they left the auction podium. Being our feature car it is a great way to top off a wonderful auction," continued Jackson. The rare 1957 Jaguar XKSS Roadster is one of only 16 originally built and with its extensive historical records is considered to be one of the most original and documented of all the XKSS cars. The Barrett-Jackson Auction Company reaffirmed its position as the leading classic car auction company with another record-breaking Scottsdale auction. The event saw an astounding 90 percent of the nearly 800 car lots declared sold, adding the 240 automobilia lots sold, pushed the total sales volume very close to $28.5 million. The final attendance the four-day auction was 175,000.